The climate is exceptionally temperate with an average of more than 300 days sunshine every year. 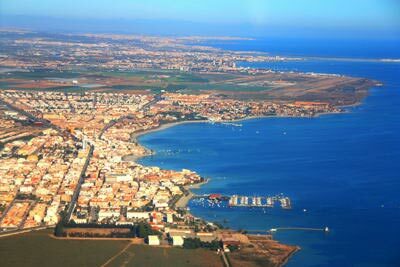 Approximately 7 kilometers from Torrevieja, Ciudad Quesada is one of the most popular towns on the southern Costa Blanca. The town with its numerous bars, restaurants, shops and banks is a popular area 52 weeks of the year. Other amenities on Quesada include a golf course, aqua park, crazy golf, bowls club, tennis courts plus lots more. The town also has a good bus service to lots of surrounding districts. The sandy blue flag beaches are only a few minutes drive away. A new urbanisation with a difference. Great care has been given to the design of this area, moving away from the normal rows of properties, there are small conjuntos of properties giving a very quiet and select feel. Under construction at Doña Pepa is a new botanical park. The park will cover over 407,084 m2 and will include numerous varieties of trees etc, an ethnological museum, picnic areas, childerns playground and lots more. Hence making this lovely area even more attractive. For anyone wanting to live in a Spanish village, Benijofar is ideal. It has shops, restaurants and bars and is only 2 km away from Quesada. Built on the River Segura, Rojales is a thriving Spanish market town. It is a very old town and cave houses can still be found in this area. During the year there are lots of fiestas held in the town keeping the area typically Spanish. Guardamar boasts some of the finest beaches on the Costa Blanca coast and its rolling sand dunes are a protected area. The town has all the usual facilities including a weekly open air market where food produce and general goods can be found at some of the lowest prices around. The restaurants are particularly noted for their wonderful seafood. 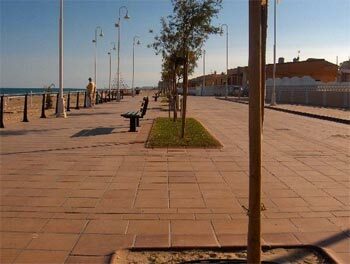 The lively cosmopolitan city of Torrevieja has something for everyone. A full range of international cuisine restaurants along with tapas bars and nightclubs are all available. Torrevieja has a really lovely promenade where you will find the famous gypsy market open from the afternoon thro to late at night. There are two marinas and you can take a ferry to the island of Tabarca or a shorter trip along the coast. There are lots of shops offering a wide range of goods (check out the cheap leather goods). There are several very nice beaches and an aqua park plus lots more to fill your day. Even with all of this Torrevieja still has a very Spanish feel about it. This is quite a large urbanisation about 5 kilometers away from Torrevieja. It has lots of shops, bars and restaurants which makes it popular all the year around. The provincial capital of Alicante is an historic city with fine shopping, castles and churches which are all well worth visiting. The Santa Barbara Castle offers a complete view of the city, including the bull ring, the port and the esplanade. The palm tree lined Rambala runs through the main througafare of Alicante and here you can stop for a drink and get the feel for the daily life of the city. As well as having the very famous La Manga Golf Complex in this area there is a long narrow strip of land about 22 km forming an inland sea or lagoon which is even warmer than the med. Hondon is an increasingly popular town for those wishing to escape the busy seaside resorts and head for the tranquility of a village in a stunning location. Although it gives an impression of solitude, it is actually just a fifteen minute car journey away from the town of Albatera, where a new golf course is under construction. It is also just twenty minutes from Elche and Alicante and the beaches of Santa Pola.